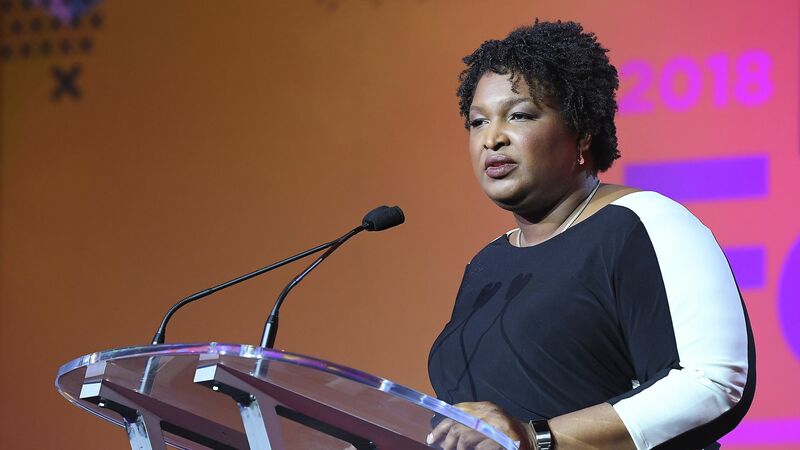 A story about Georgia Democratic gubernatorial nominee Stacey Abrams participating at a 1992 burning of the state's Confederate-inspired flag is resurfacing in the final days of the contest for Georgia's governor’s mansion, the New York Times reports. Why it matters: The Republican candidate for governor, Secretary of State Brian Kemp, who is white, has called previous protests of Confederate symbols attempts to "rewrite" the past and has sought to quash the movement to remove Confederate statues. The version of the flag burned in 1992 was adopted in 1956, during the Civil Rights movement. Abrams, who would be the first black female governor in the U.S. if elected, favors removing the statues. "Protesters toppled the Silent Sam Confederate statue on the campus of UNC-Chapel Hill" last night, The (Raleigh) News & Observer's Jane Stancill reports. The details: "The monument was ripped down after 9:15 p.m. Earlier in the evening, protesters covered the statue with tall, gray banners, erecting 'an alternative monument' ... 'For a world without white supremacy.' ... Protesters were apparently working behind the covering with ropes to bring the statue down, which happened more than two hours into a rally. It fell with a loud clanging sound, and the crowd erupted in cheers."